HERBERT KITCHENER Autograph LETTER Signed. Irish born British Field Marshal. ALS. 2pp (with integral blank leaf). Horse Guards, Whitehall, S.W. June 20th, 1896. To [William] Woodall. Together with a fine portrait photograph. "The £100 paid in 1888 to the 'R[oyal] Cambridge Asylum for Soldiers' Wives' was in settlement of a dispute between the representative of the Agricultural Hall, Mr. Raffety and the Tournament Committee. Mr. Raffety selected the charity, and paid the money, which was sent in the name of the Committee." 8vo. Approx 7 x 4.5 inches. Slight crease. Mounting residue and slight damage to verso of integral blank, not affecting text leaf which is otherwise fine. The photograph is a fine 19th century gelatin silver print measuring approx 6 x 4 inches (excluding mount), laid down on card. It shows a young Horatio Herbert Kitchener (always known by his middle name Herbert) in head and shoulders vignette, facing to his right and with his fine moustache much in evidence. There are mounting traces to verso of mount but the photograph is in fine condition. Both the LETTER and the photograph are from a 19th century collection made by the radical Liberal M.P., William Woodall. 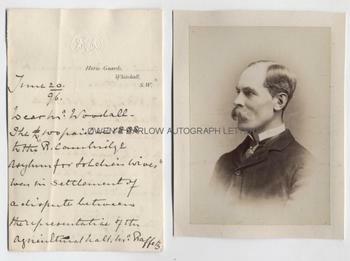 At the date of this letter, Woodall had lost his place as Financial Secretary to the War Office, following the fall of Lord Rosebery's Liberal government in 1895. He was still M.P. for Hanley. The Agricultural Hall which Kitchener refers to in his letter was later renamed Olympia and when it reopened at huge expense the organisers had hoped that it would be the venue for Royal Tournament. When the tournament committee did not transfer, Olympia's owners were left in severe financial difficulty. The payment which Kitchener refers to appears to be a settlement made by the Committee following a legal or contractual dispute. At this time, Kitchener was Sirdar of the Egyptian Army, heavily involved in the war against the Sudanese, although he had not yet found fame as victor of the Battle of Omdurman, which took place in 1898.